Glorious Poison, 2016. Ink, coffee, and acrylic on paper, 44 x 30 inches. Seaton, 2016. 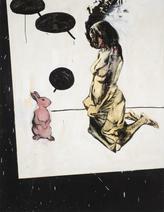 Ink, pastel, polyurethane, and acrylic on paper, 44 x 30 inches. Conversation, 2016. Ink, polyurethane, oil, and paper on canvas, 70 x 50 inches. Flamenco, 2016. Ink, white-out, acrylic, and paper on canvas, 60 x 52 inches. Untitled, 2016. Ink, coffee, acrylic, and paper on canvas, 60 x 60 inches. Wish You Were Here, 2016. 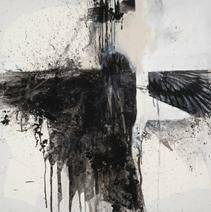 Ink, coffee, acrylic, spray paint, and paper on canvas, 98 x 64 inches. Film by Eric Minh Swenson as part of his Take 1 Art Series. 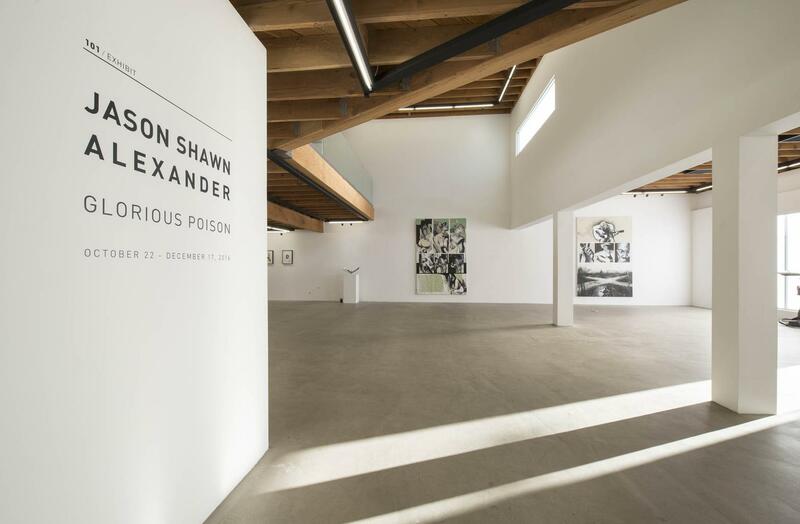 101/EXHIBIT proudly presents Glorious Poison, a solo exhibition of new works by Los Angeles-based artist Jason Shawn Alexander. 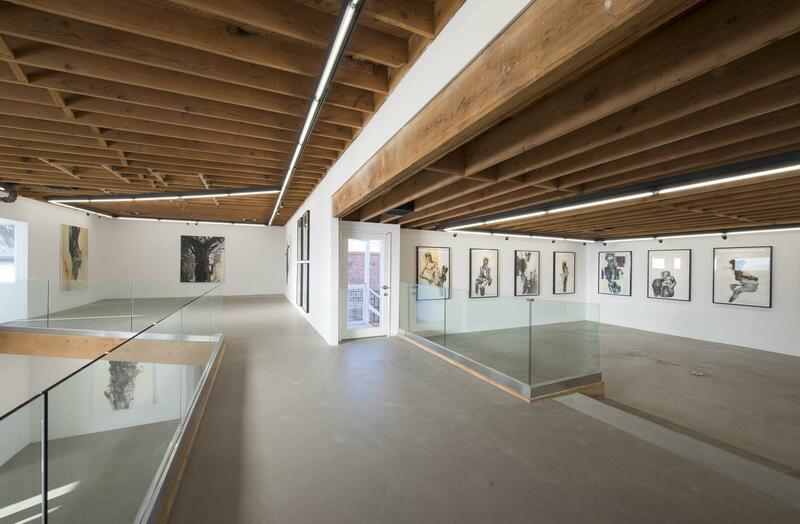 This occasion marks Alexander’s 5th solo showing with the gallery, and is his third in Los Angeles. 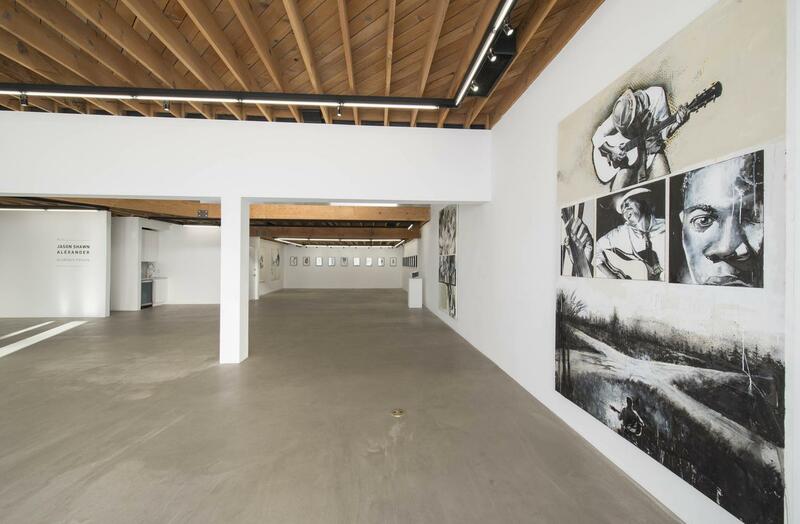 The opening with the artist will be held from 6-8pm on Saturday, October 22nd at 668 N La Peer Drive, located on the southeast corner of the Santa Monica Blvd and N La Peer Drive intersection. During the opening from 6:30-7pm, Alexander will be available for signing catalogs and other commercial works owned by show attendees. 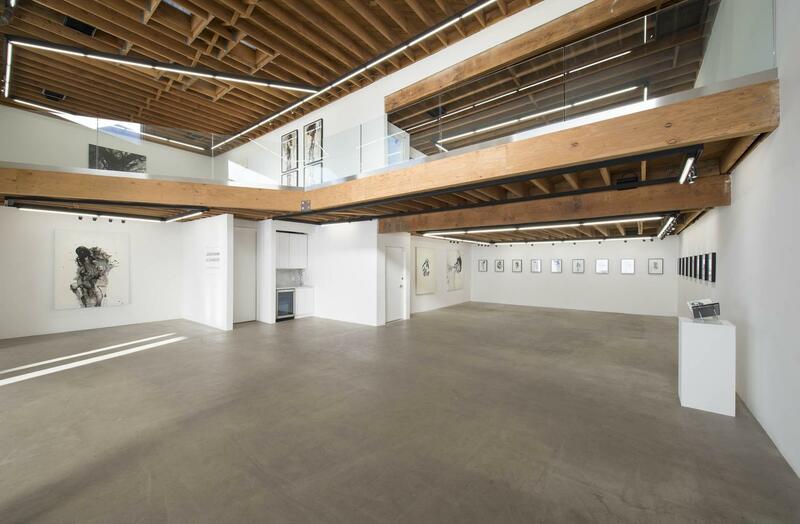 The exhibition will run through December 17th, 2016 and will occupy both floors of the gallery. 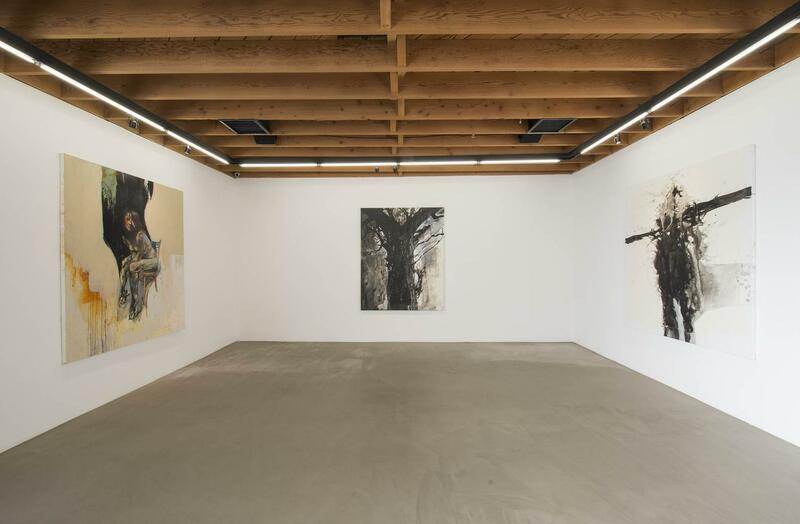 For this exhibition, Jason Shawn Alexander abandons the oil-on-canvas prevalence of his previous four shows in exclusive favor of ink-based paintings on canvas and paper. This is a significant shift in material for an artist who has dedicated years to painting in the traditional sense. With a further look into Alexander’s history, this transition to ink is more of a return to form than it is a stylistic change. The foundation of Alexander’s career began as a comic book artist and writer. 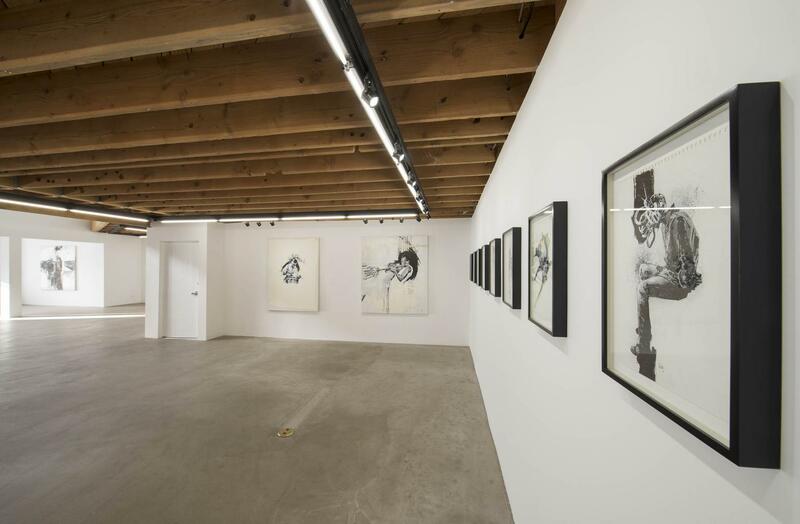 Storytelling and the use of ink were early elements of fervency as he began his artistic pursuits, which have spawned into his now prolific career in image making. In his formative stages as an artist, Alexander quickly gained notoriety for his draftsmanship but had an understanding that serious gallery work was generally reserved for loftier mediums. 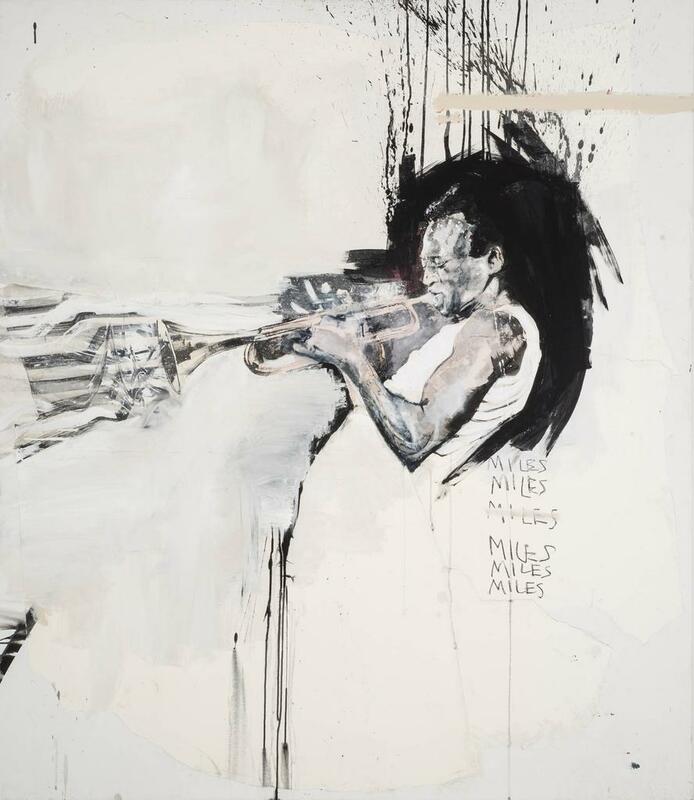 As his practice continued to evolve, his use of ink was relegated to a functional role in favor of paint in the tutelage of artists he mentored under or drew inspiration from. In 2014, Alexander produced No Good At Exits, a hugely ambitious show of 28 paintings. In the vast majority of oil-on-canvas and mixed-media works, four pieces in particular (re)surfaced, The Mourners. 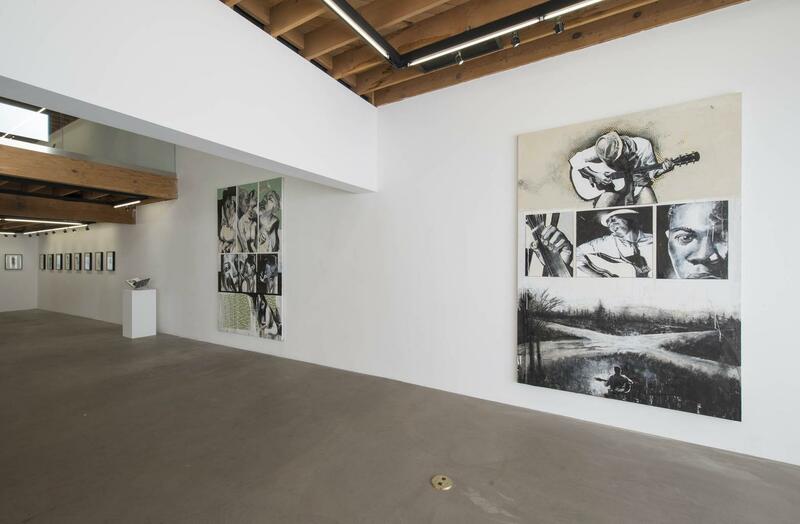 Titled “Mourners 8, 9, 10, and 11” respectively, these were large-scale ink paintings that picked up from where this major series of work left off in 2010, when Alexander began to heavily implement paint. 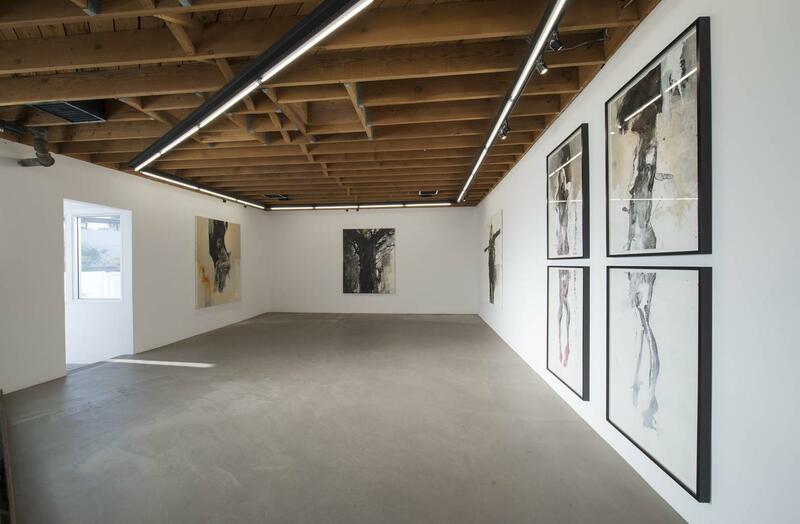 This development proved to foretell a return to his foundations, as Alexander has since dedicated his studio practice entirely to ink and drawing for the past two years. Having reignited his natural prowess in drawing, Glorious Poison is no longer a question of medium, but a declaration of a well deliberated decision. Drawing is Alexander’s original and true love, and this exhibition highlights the practice that the artist engages in daily, habitually. He is nearly always found, anywhere and at any time, with ink and sketchbook in hand to satisfy a fix for his compulsive and constant need to render his surroundings. When we think of ink, the immediacy of the printing press comes to mind. 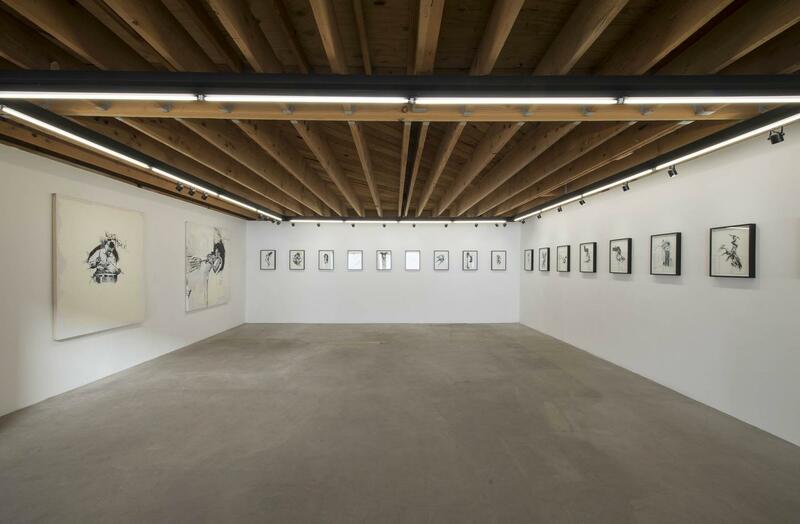 Artistically, Keith Haring’s sumi inks or the drawings of Raymond Pettibon are quick references. Conceptually, the dead black color of liquid ink functioned as a surreal viscous Minimalist sculpture in Charles Ray’s Ink Line from 1987. From a 20th century perspective however, ink began to gain artistic respect in the 1960s per the inker of comic books. As the printing press could not recall the subtle nuances of the pencil, it was the inker’s job to salvage, accentuate, and convey an image whilst not obliterating the draftsmanship of the penciller. It is these essential properties that cater to the physicality of Alexander’s technique. The immediate, violent contrasts inherent to ink are akin to Tenebrism, which good comic storytelling has expounded upon for decades to set the mood. Further to 20th century art, Alexander often cites the aesthetics of German expressionist Käthe Kollwitz for her stark, simplified, and boldly accentuated depictions of the proletariat, and the dark, somber, monochromatic drawings of Los Angeles luminary Rico Lebrun. It is also within this aesthetic context that a narrative is formed by way of artistic rigor, and in this show, Alexander goes beyond the historically prevalent examples of other comic-derived appropriations, such as those by Lichtenstein or Pettibon, to a sort of “Sequentilism”. Two major examples of this Sequentialism will appear in Glorious Poison. At 98 x 64 inches, the compositions of these ambitious paintings will function as singular panels that chronologically depict a narrative situation from numerous positions within a singular moment. These differ from the Cubist’s efforts to show the 4th dimension of time, which enabled artists to depict a multitude of visual perspectives at once. Alexander is instead interested in orchestrating and emphasizing an array of important plot devices into a singular work. By segregating imagery into numerous frames, he further deepens and dictates a particular experience beyond what has been thoroughly explored before in a static 2D image. In conclusion, Glorious Poison is titled as such as a declaration of admission, or a conceding to truths about who one really is, and what things they are ultimately concerned with. “Pick your poison” or “what’s your poison” says the bartender, expressions that soften and invite one’s vice to surface without judgment. This exhibition glorifies Alexander’s roots as a true draftsman who prefers ink and storytelling. 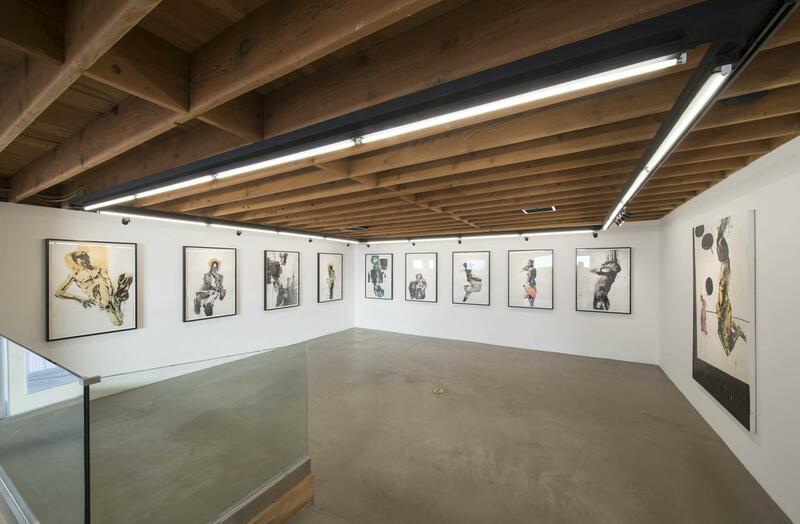 It also celebrates his artistic journey and his ever-growing expertise in the field of creating compelling and remarkable imagery, that is neither solely figurative nor abstract, but walks the path between said polarities. 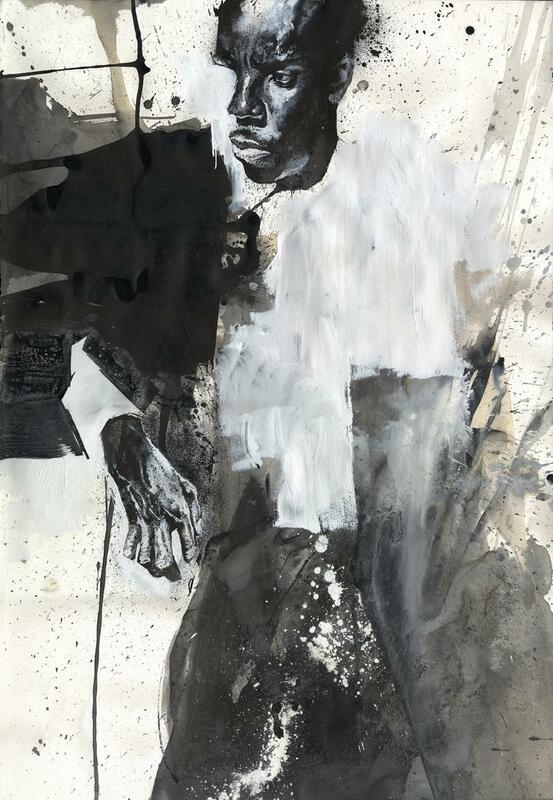 Jason Shawn Alexander was born in Tennessee in 1975. He lives and works in Los Angeles, CA. He has participated in American and international solo and group exhibitions at numerous galleries, museums, and art fairs including Art From the New World at the Bristol City Museum, Bristol, England, Outwin Boochever Portrait Painting and Sculpture Exhibition at the Smithsonian National Portrait Gallery in Washington, DC, Art Miami, Miami Project, Scope Miami, Strychnin Gallery in Berlin, Germany, and Merry Karnowski Gallery in Los Angeles, CA. Alexander has also worked for over 20 years as an illustrator. Primarily working in comic books, he has earned two Eisner Award nominations and the Silver Medal from the Society of Illustrators. He has created, written, and illustrated his own critically acclaimed title, EMPTY ZONE, through Image Comics. He has also co-created titles like FROSTBITE for Vertigo/DC Comics and worked with publishers including Marvel, DC, Dark Horse, and Oni Press. He has also supplied art and storyboards for independent and short films, as well as motion comics for films such as Pan’s Labyrinth and Predators.